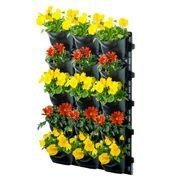 Anyone with a green thumb or simply a passion for gardening definitely needs a great place for their plants and flowers. While the traditional pots outside or a garden bed is great, you can always take your plants to new heights by getting creative homes for them that can be suitable for both indoor and outdoor environments. They can even be decorative in many unique ways. Start getting the right homes for your plants when you look through our collection of garden planters. We have many different types of designs and capacities. It is better to get one with a design rather than plain, so it can have a better decorative value in any space. If you want to make great use of blank wall spaces, you can decorate it with our wall kits, these come with several spaces and slots for various types of plants. Find the right one for you in our collection of amazing items. Get your garden ready for all our amazing decor. We ship to any address in Australia with no fuss. Some of our items even come with free shipping so you can save more. If you have any questions about our items, feel free to call our customer service team or send an email. You can also fill out our various online forms and send them directly.